Andrew Rawnsley in last Sunday’s Observer identified, quite correctly, the dilemma facing Labour. On the one hand, the economic arguments indicate more and more strongly that George Osborne has got it wrong and that a new approach is needed; but on the other hand, the political reality is that the voters continue to believe that tough measures are needed and that the Tories are best able to deliver them. The dilemma is all too familiar. The left has always struggled to move the economic policy debate beyond the constraints imposed by right-wing orthodoxy. And they have never grappled with the fact that the proposed remedy – that they must conduct the debate as framed by their opponents – means that the dilemma can never be resolved. The current dilemma illustrates this well. The Tory insistence that austerity and cuts are the only issue that matters has convinced a large part of the electorate that any alternative that fails to address this goal cannot be supported. But a Labour readiness to show, for the sake of credibility, that they too are ready to inflict pain will multiply rather than solve their problems. The acceptance of the Tory analysis would saddle Labour with immediate and multiple disadvantages. Any criticism of Tory strategy is straightaway rendered ineffectual, because they are reduced to attacking the outcomes rather than the analysis and its conclusions; and if they are then challenged to explain how, in the context of the same analysis, they would produce different outcomes, they have no answer. Furthermore, posing as ersatz Tories, committed to making the same “tough choices” but doing so with a sympathetic and regretful expression, is unlikely to persuade voters that they would not be better off with the real thing. And the Tories will in any case, as Andrew Rawnsley points out, play it both ways by casting doubt on the genuineness and reliability of Labour’s commitment. So, is there no option other than a capitulation that not only jeopardises Labour’s electoral appeal but also – and more importantly – denies the economy the measures that it really needs? My own political experience leads me to recommend a quite different strategy. It would require courage and hard work, but the benefits to Labour’s electoral chances and to the country’s economic prospects would be immense. The starting point would require no dramatic rejection of the prevailing public perception of what is required from economic policy. It would accept that a reduction of the government’s deficit is highly desirable, and that vigilance must be exercised in ensuring value for money in public spending, though it would point out that the government’s strategy has meant continuing cuts that seem only to make matters worse. 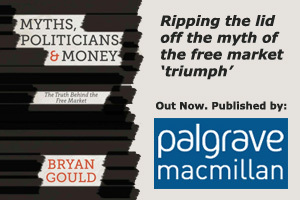 It would go on to argue that there are much more effective ways of tackling the deficit, provided that it is no longer treated in isolation but is seen as a part of the overall economic picture – because it is, in many respects, a symptom rather than a cause of our wider and more deep-seated problems. Those wider problems – of lost competitiveness, of inadequate liquidity, of a weakened productive base, of high unemployment – will not be resolved by ignoring them (as the Tories are doing), or by weakening the economy still more by further cuts. On the other hand, if we address them constructively, a stronger and more buoyant economy will not only raise employment, investment and living standards, but will in the course of doing so resolve the deficit problem as well. There will be many who will quail at the prospect of trying to sell such an approach to a sceptical electorate. But there are good reasons to take courage. First, we don’t have to win the argument tomorrow. We could expect an immediate barrage of criticism but we have until election day to build understanding and support for what we propose. I recall, in the run-up to the 1992 election, the differing fortunes of two different Labour policy initiatives. The tax policies were held back until the election campaign and were a disaster because, with so little time to get them across, they were easily misrepresented. I released our alternative to the poll tax, on the other hand, (on which subject we had been constantly challenged by the Tories) well before the election, and it was widely accepted by the time polling day came. This time, we have the further advantage of being able to work with a significant and continuing shift in expert opinion. From the incoming governor of the Bank of England to leading monetary economists, there is a renewed interest in a different approach. And the successful experience with that approach of leading economies overseas will also strengthen our case. These factors may not impact immediately on public opinion but -with hard work on our part – will help enormously to force the Tories to join the debate on our terms. Yes, the dilemma is not just economic but inevitably political as well. That means we can end it only through political action. Isn’t that what politicians are for – to build support for what they believe is right?